121 Group has emerged as a leading international investment events and investor relations business. We work with hundreds of professional investors annually in Hong Kong, London, Cape Town, Singapore and New York, organising 1-2-1 meetings with mining company management teams at our 121 Mining Investment events. Our investor relations programme will put you in front of our network all year around. By hosting 121 Mining Investment events we have an unparalleled network of relationships reaching into the Americas, Africa, Europe and Australasia. Drawing on extensive local knowledge we help connect globally-sourced investment opportunities with investors in the world’s key financial centres. Our Investor Relations services are tailored to your needs. Leveraging our global mining event series, our investor knowledge and contacts are second to none. To discuss in further detail how we can help you, please get in contact. We can handle the distribution of your company’s announcements, to your internal mailing list and 121 Group’s global investor network, freeing up your time to focus on building your business. 121 Group’s global distribution list is built from a database of vetted investors, which includes information on their specific investment preferences based on commodity, project jurisdiction and stage of development. To avoid investor fatigue and maximise open rates and read rates, distribution to our 121 distribution list is dedicated to price sensitive announcements only. Our investor list is continually updated throughout the year with information gathered from investors at our events and roadshows. – On a regular basis we will provide you with detailed analysis from your targeted distribution. – Analysis reports include results from each announcement, as well as collectively summarise the full distribution via a trend analysis (Figure 1). – For each announcement, companies will receive a list of the funds reading their news and the countries in which they are located (Figure 2). 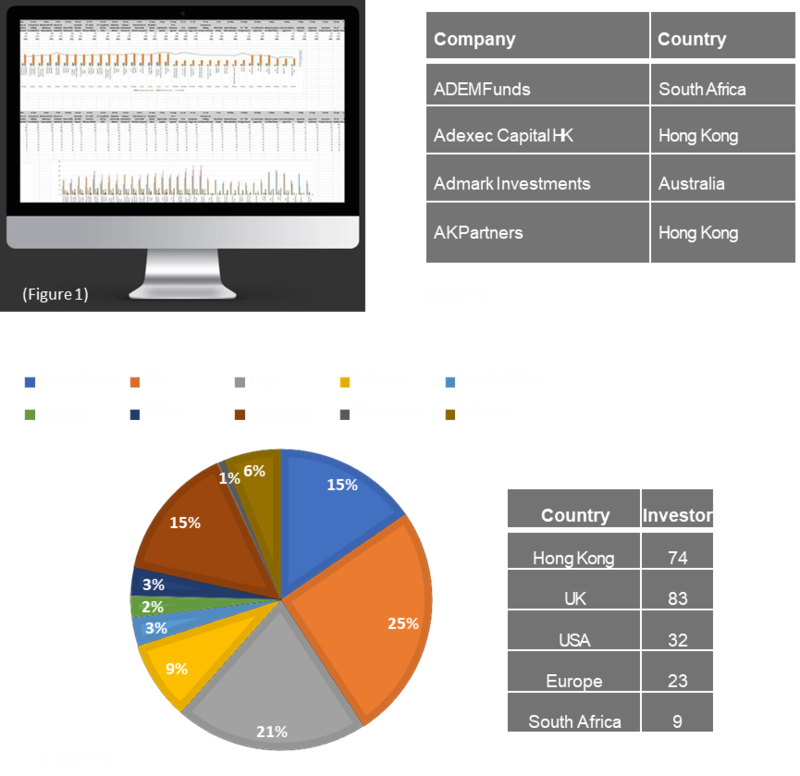 – Companies will also receive a chart showing investor numbers by country and the proportion of investors who opened the announcement by location, to support your future marketing, roadshows and events (Figure 3). – By utilising the distribution analytics and tracking your ‘top readers’, we can advise you on your approach to roadshows and events. • We create an annual IR annual report that acts as an account summary of your work with 121. 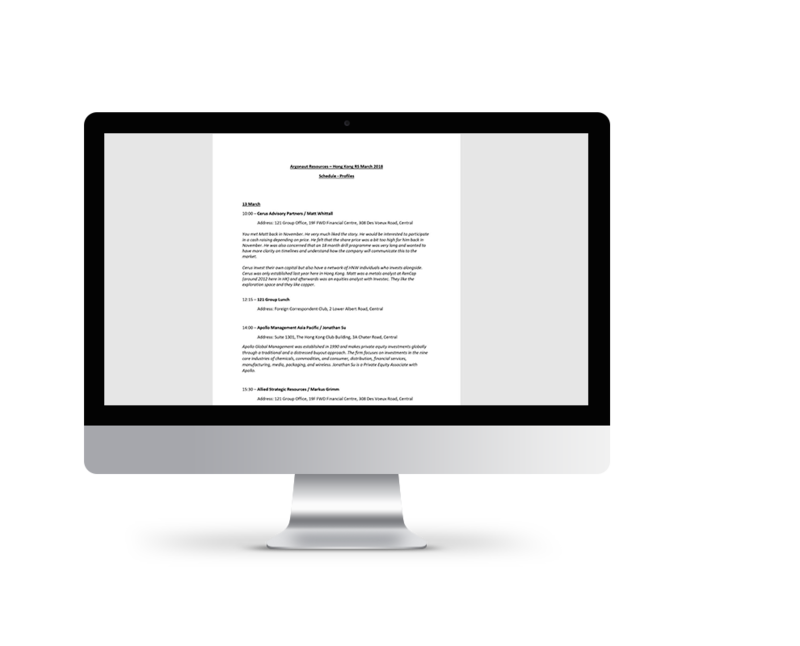 • This document collates all of the information collected during your IR partnership with 121. • This annual report can be used to show board members, present to shareholders, used as a business case for further investment or to be used for planning purposes for new strategies. – Using the distribution analytics, 121 Group can help you to identify which countries and cities are likely to generate the best results for your roadshows and event participation. – Develop a targeted list of investors based on distribution, investor feedback, historic schedules and all other market intelligence platforms. – Coordinate meeting schedules based on target lists and around those investors who have been more engaged with a company’s news flow. – Prior to any event or roadshow we provide investor profiles, which help target your message during your meetings. – 121 group conducts follow up phone calls with the investors and provides companies with a feedback report. All you need to do is show up.